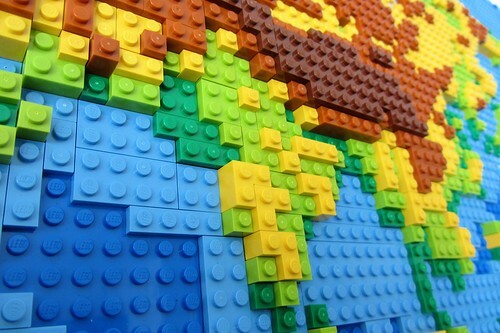 Discover the world – brick by brick! You can also read this article on my blog in in english or german ! 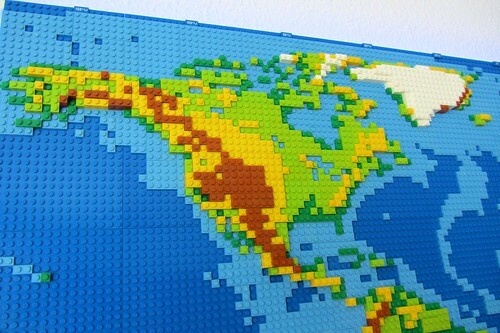 after building my LEGO Globe I came up with the idea of building a flat map of the earth in LEGO. 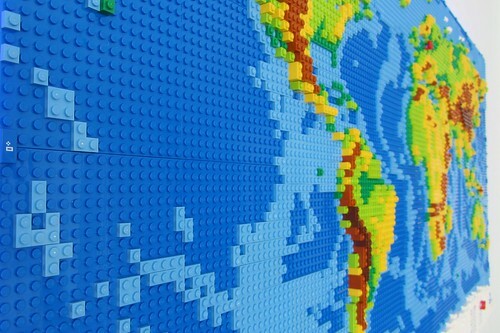 I realized this idea with the LEGO micro world map. Some years later we wanted to have a big picture for our living room but couldn’t agree on a motive. 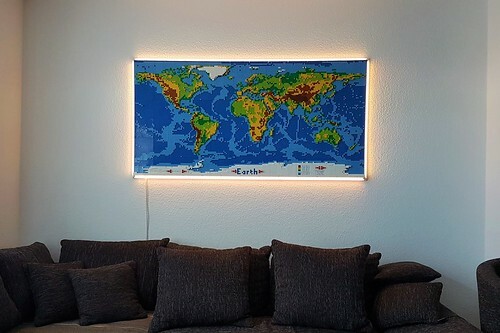 At the end of 2015 my wife gave me some blue LEGO baseplates and said, I could build a big world map out of LEGO for the living room. So the idea was born and the starting point for countless evenings of planning was there. 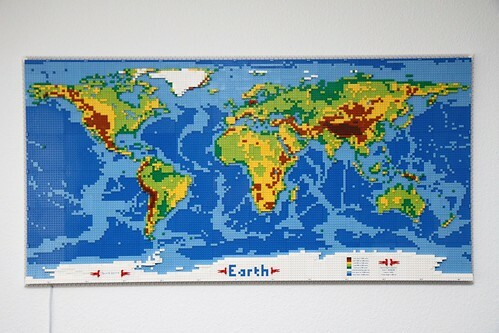 This world map isn’t the first made out of LEGO. 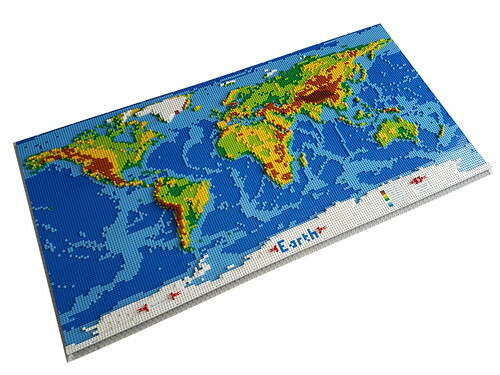 If you search online, you will find other LEGO world maps, which unfortunately haven’t fully met my expectations. Some are only concepts, some are too small, other too big for a living room - like this two examples :-) link 1, link 2. There are experimental maps and those with unusual colors or other peculiarities. My map should have the size of a medium-sized wall-painting. 160 cm (60 inches) width seemed to be a pleasant size. 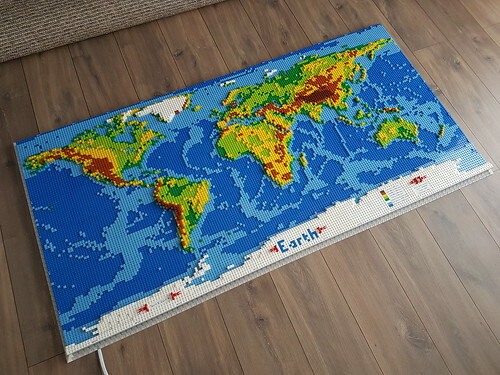 An advantage of this size was additionally, that the number of studs on a map with this dimensions is divisible by 12 (30° on earths grid lines) and 16 (number of studs on the largest normal LEGO plate). 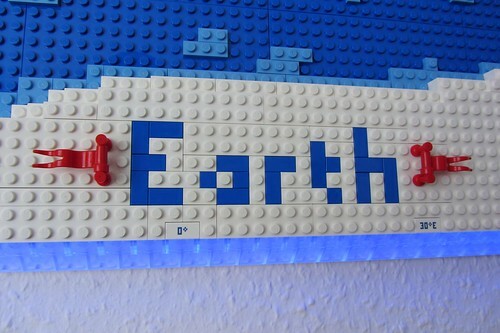 So it provided a great base for the earth’s grid on LEGO bricks (30° on 16 studs). I started to read a lot about projection methods of maps for this project. In short, the general problem of maps is that a sphere is not a flat surface. And so every projection of a sphere onto a flat surface has to deal with distortions or the loss of details depending on the purpose of the map. A short introduction video into projection can be found here. If you are interested to dive into cartography and projection for hours, you can click here: link 1, link 2. I also like this picture a lot. Finally I decided to choose the equirectangular projection. To me it has a good trade-off between distortion of area and distortion of lengths. Significantly relevant for my decision was that you can easily read the geographic coordinates (GPS) from the maps grid. Further Nasa‘s picture “Blue Marble: Cloudless Earth" (composed from multiple satellite images) with the same projection method was very inspiring to me! 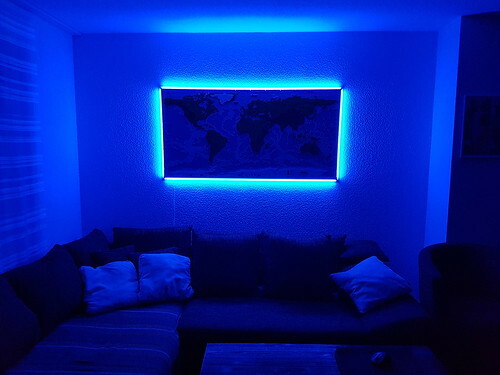 After deciding on the basic setup of my map, I had to make the color selection. 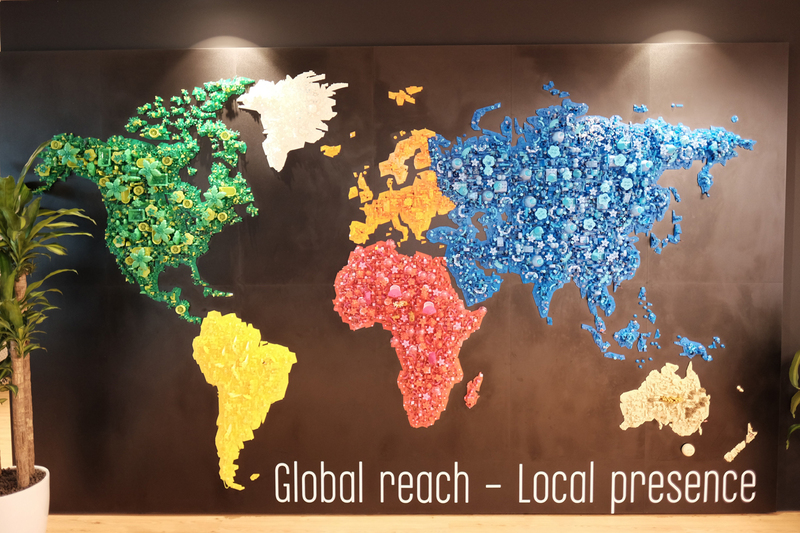 In general you can represent everything you like with colors on a map, like vegetation, country borders, population density, the number of researchers per million citizens or the coffee consumption per capita. If you want to see really exciting maps, you can dive deeper here: Strangemaps. 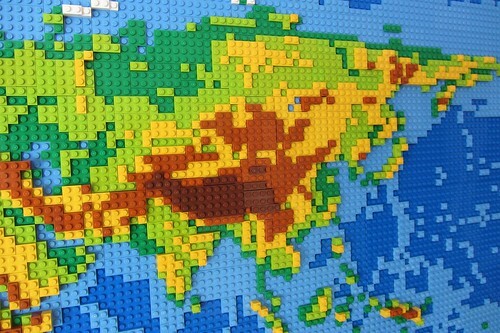 Most useful to me was the representation of altitude levels with colors (like on my LEGO globe). I decided to use more colors then on my globe, because the map would be much bigger and colors can spread out across the map. So there are 2 colors for water areas (deep and shallow water) and 6 colors for land areas. Only one color for water would have made the map very monotonous and more colors for the land area would have created too much disturbance (according to my taste). To choose specific LEGO colors I remembered the beautiful representation in schoolbooks, which I adapted with the LEGO colors blue, medium blue, green, lime, yellow, dark orange, reddish brown and white. To determine the boundaries of land and water or the color for every pixel of the map, I used the great open-source program marble, which I already used for my globe. I adjusted the colors of the contour lines in marble to my expectations and chose common altitudes from existing maps: approx. 200, 500, 1.500 and 4.000 meter (approx. 650, 1.600, 5.000 and 13.000 feet). This gave a pretty good color distribution on the map. A separation of water colors at approx. 2.000m (6.500 feet) shows the boarders of the continental plates very well, so I choose this depth separation for the water colors. In the end I had an exact map of the world in marble. 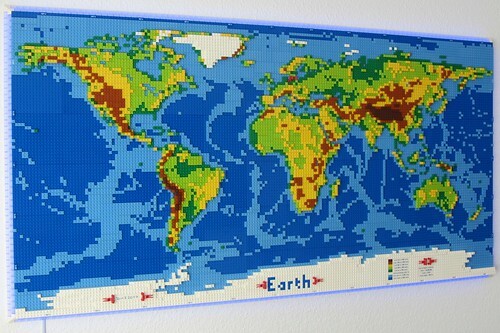 Before translating the pixels into LEGO bricks, I had to think about making the map either flat or bumpy (build a relief upwards). 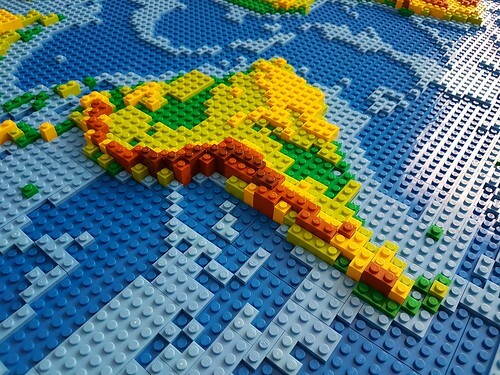 A flat map would have made the planning a lot easier, because you just had to build plates or bricks next to each other on a big baseplate. An actual relief requires more complex planning - you have to deal with the third dimension. 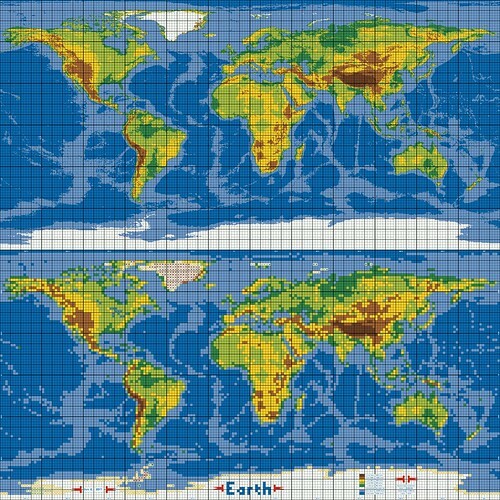 But optical and haptical a relief map gives a much better impression of earths topography. 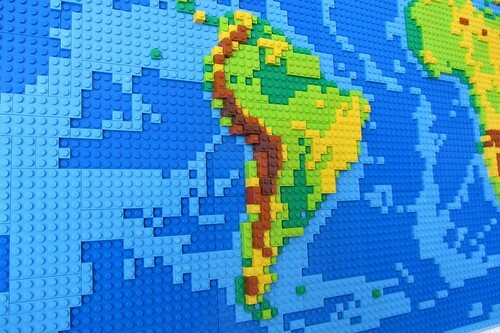 Finally I could start to realize the map with LEGO. 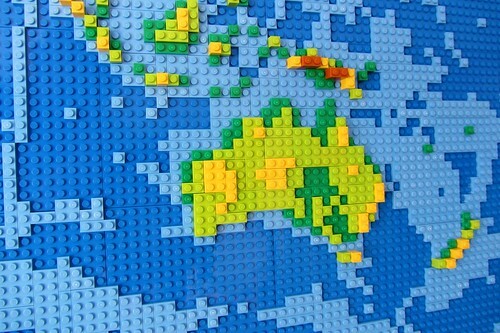 I planned my map digitally with the LEGO Digital Designer. Unfortunately not all bricks and plates in all color variants are available online, so I started making a list with easily available bricks/plates on bricklink. For example 2x2 corner bricks in lime or certain plate-sizes in medium blue or dark orange are hardly or not at all available. This complicated planning a lot, because in some cases I had to use bricks instead of plates and so had to replan lower layers. 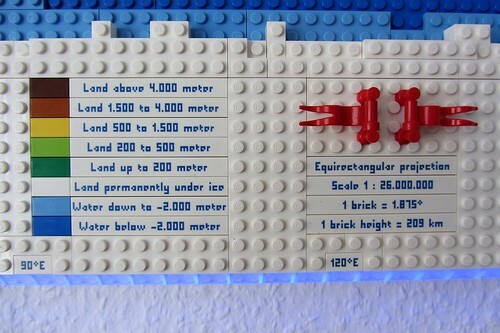 I also had to think about the actual arrangement of LEGO bricks. My aim was to use as little bricks as possible to lower the total number of bricks. 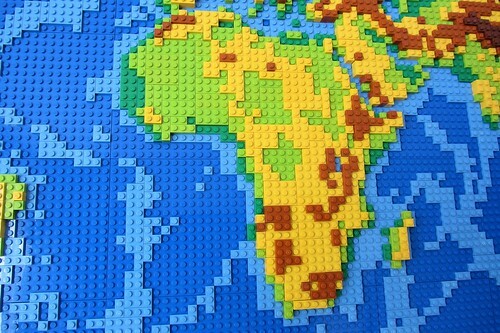 You can of course just build this map with 1x1 plates, but that didn’t seem very reasonable to me. 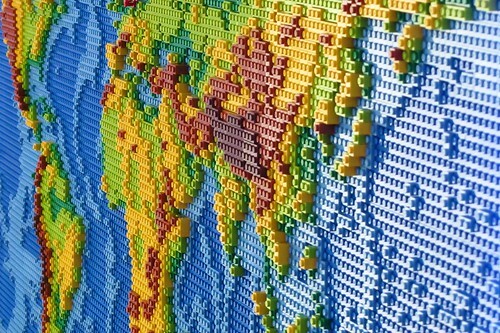 :-) This planning period lasted longest by far, because there are countless possibilities to arrange LEGO bricks. Here again I made changes from time to time over a long period and rearranged the layers multiple times. 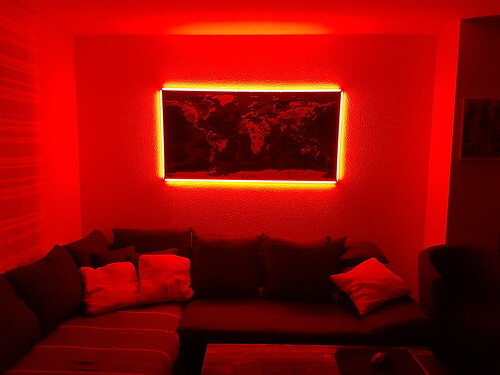 By the way, the entire system of LED-strip, power-PWM and LEGO bricks is never getting hotter than 40 degree Celsius, which is just lukewarm and far below the melting point of LEGO – after measuring the temperatures I could go on planning calmed. After several attempts with different types and forms of frames I decided for a simple frame. 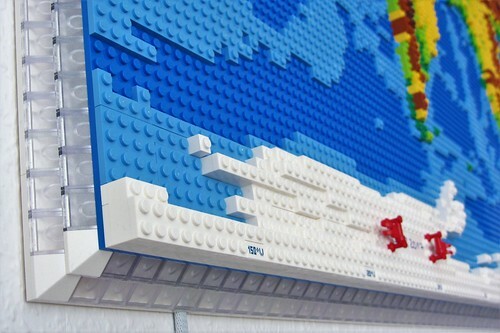 Although there are impressive examples of very nice LEGO frames out there, I wanted my frame not to distract the viewers’ attention from the map itself. The lighting effect in the frame was enough eye candy to my point of view. The frame is very rigid because of its solid construction partly under the map and gives additional steadiness to the map. Without that frame the map would bend or break, if you would try to raise the map from the ground. I use two metal bars for the wall attachment. One is attached to the wall with screws. Onto the other one I glued two layers of LEGO plates and one layer of LEGO bricks. 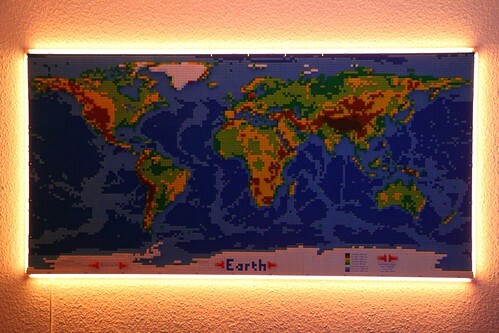 So I was able to attach the second bar to the map just with LEGO studs and didn’t have to glue the map itself. Gluing LEGO on a metal bar wasn’t as easy as I thought it would be. After experimenting with normal superglue and two-component adhesives (epoxy based glue) I used industrial superglue with superglue filler. This combination is more than sufficient to hold the map. 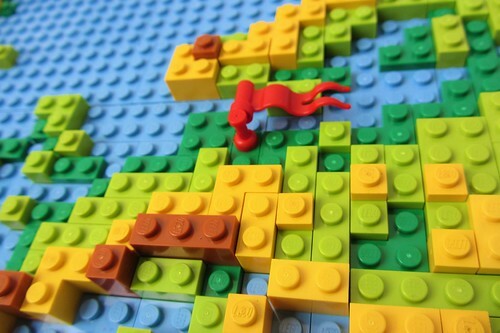 I also ordered custom printed LEGO tiles to provide useful information for my map. You can find information about latitude and longitude, a legend of altitudes, general information and a signature on the map. Other decorative elements are the little flags. Globetrotters could mark every spot they visited on earth. The last decorative element is the treasure within the Himalaya – my kids love this place! 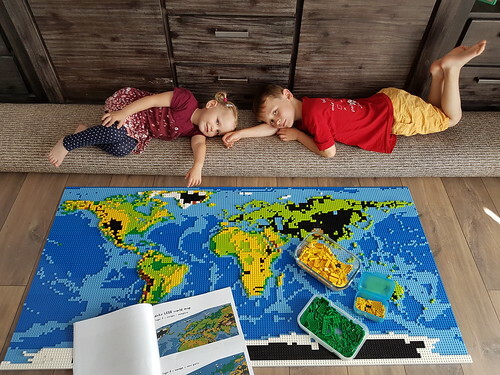 Building the map has been a lot of fun and my kids and I had a great LEGO weekend with it! I created an instruction before actually building the map. 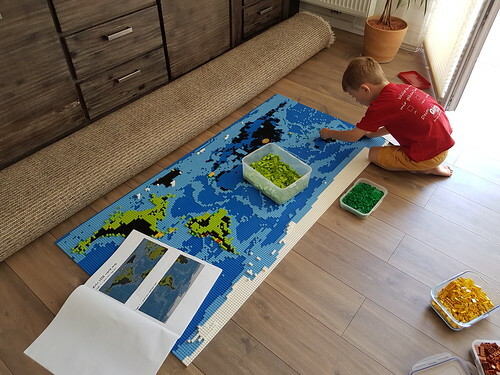 So it was very easy even for my kids to build the map. The instruction accompanies the whole building process and is divided into single steps for each layer and each continent. Every step shows the new parts and a view of the finished step. Every layer is additionally divided into two steps – first you build the plates and then you build the bricks. So it is very easy for kids to place the bricks/plates right. The instruction also includes a parts list and hints for the building process (including building the frame, installing the LEDs and building the wall mount). 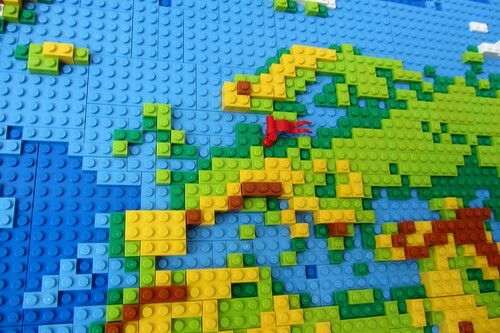 If you want to purchase the instruction for the LEGO world map, you can click here. Finally I want to thank my wife for the idea and the support while planning and realizing this project! I hope you enjoyed – thanks for stopping by! This is outstanding. A true masterpiece. Well done! Stunning! It looks fantastic! What a great idea. Honoured to be the 50th like for this amazing build. This is truly impressive art. You could almost say it's... Out of this world. Superb map and write-up! As a retired geologist and life-long map nut with a special interest in global tectonics, this map tickles me no end. 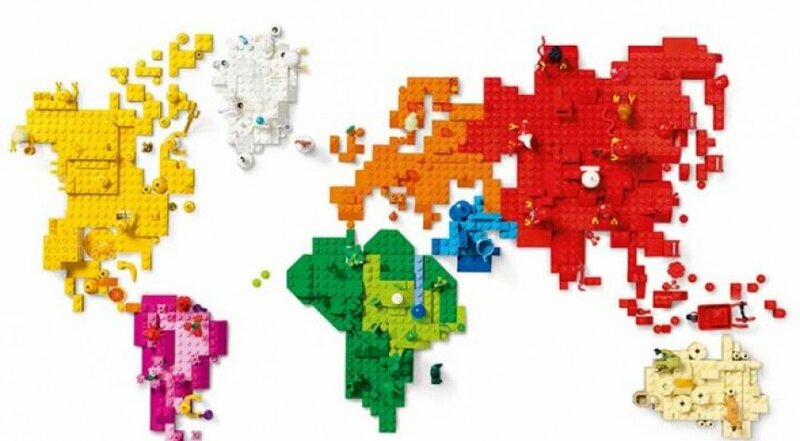 I've spent a lot of time with physiographic maps and map projections over the years -- including 3D maps and maps colored for elevation and bathymetry -- and I have to say that you've captured these map styles remarkably well in LEGO. 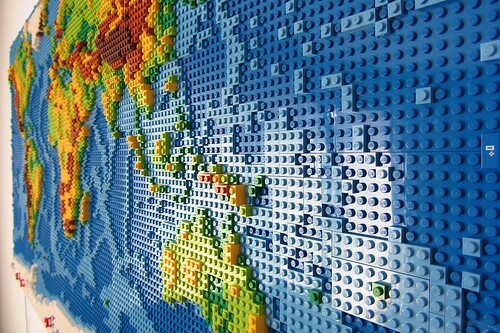 Absolutely agree with Lego builders! 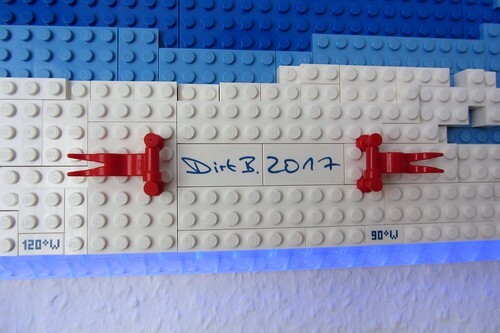 Very entertaining MOC and presentaion, Dirk! Brilliant! A great idea, and a great build as well. Interesting to read about the process too :-) Looks awesome on your wall by the way! Awesome! And a great place to display it, too! 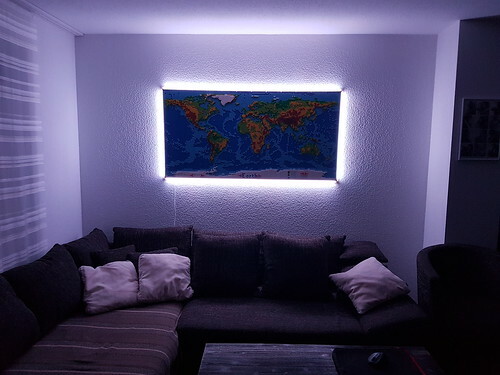 That is an amazing map of the world! I had thought of doing something like this a couple weeks ago, but I have to travel so much for work that I rarely get time to build anymore except for some small projects with my son who is now 10. Incredible work! Love the thorough and very interesting writeup on the process and research! Great MOC/work of art!! I love this. The project, the write-up, wonderful stuff. Beautiful work! 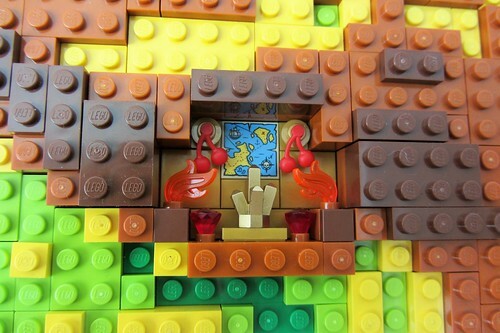 Given the time and money I would totally buy the instructions and bricks to make my own. Great execution of a great idea. Love the map. But the best thing is the time spent with your family.